Very basically it works like this: An "antibody" is an agent of the immune system that attaches to an "antigen" — usually antibodies recognize antigens on a virus or bacteria and attach to the invader to mark it for destruction by other immune cells. In this case, CU Cancer Center researchers engineered an antibody to recognize and attach to a protein called EGFR. Bladder tumors but not healthy cells often slather themselves in EGFR. Other researchers have hooked molecules of chemotherapy to antibodies that recognize EGFR and have used this antibody-antigen system to micro-target the delivery of chemotherapy. In this case, researchers used nifty chemistry to attach gold nanoparticles to antibodies (because, gold nanoparticles). Imagine it: Now you have a two-part thingy made from a gold nanoparticle attached to an antibody that seeks out and binds to EGFR on the surface of bladder tumors. If only there were a way evilize the nanoparticles! Oh, but there is. It's called plasmon resonance, which is a physics term for the process that makes nanoparticles vibrate in certain frequencies of light. You can "tune" nanoparticles to experience plasmon resonance at a chosen frequency. This is undoubtedly very groovy but what's really going on is energy transfer from the light to the particle in a way that creates heat — and a lot of it in a very small area. In this study, researchers tuned their gold nanoparticles to experience plasmon resonance in near infrared light — a wavelength of light that is generally safe by itself. Finally, when they shined a laser's near infrared light on the nanoparticle-antibody conjugate, it aggravated the nanoparticles, which heated up and fried the nearby tumor tissue like Han Solo with a DL-44 heavy blaster pistol. Evaluating the results required bioluminescence. That's because the test tumors were very small bumps on the bladders of mice. It wouldn't have been possible to measure them by hand. Instead, tumors were grown using cells that express the enzyme luciferase, which makes them glow, like fireflies… The more a mouse bladder glowed, the more cancer was present. And conversely, the less it glowed, the more cancer had been killed by hot nanoparticles. The study compared mice injected with EGFR-directed nanoparticles and laser light to mice only treated with laser light and found that, indeed, tumors in mice with targeted gold nanoparticles glowed less than their counterparts in the control group. In fact, these tumors glowed less than they had before treatment, implying that the technique had successfully slowed and even reversed tumor growth. Side effects were minimal. 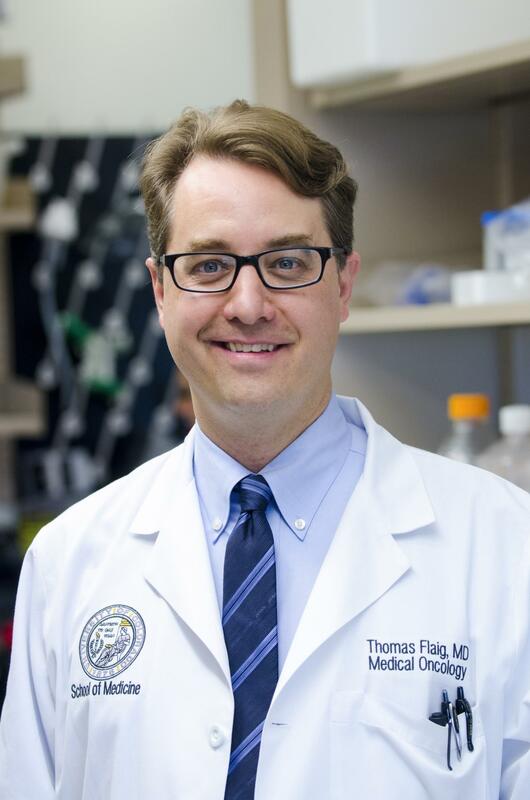 "We are highly encouraged by these results," says Thomas Flaig, MD, associate dean for Clinical Research at University of Colorado School of Medicine and Chief Clinical Research Officer of UCHealth. The project represents a long-term collaboration between Flaig and Won Park, PhD, the N. Rex Sheppard Professor in the Department of Electrical, Computer & Energy Engineering at CU Boulder. "It's one of the great stories in scientific collaboration – Won was on a sabbatical of sorts here on campus and we sat down and started talking about ideas around our mutual interests. How could we bring the nanorods to a tumor? The answer was EGFR. What cancer site would allow us to deliver infrared light? Oh, the bladder! And how would be deliver it? Well, in bladder cancer there are already lights on the scopes used in clinical practice that could do the job. It's been an interesting problem-solving experience pursuing this technique from a futuristic idea to something that now shows real promise in animal models," Flaig says. The article titled "The Antineoplastic Activity of Photothermal Ablative Therapy with Targeted Gold Nanorods in an Orthotopic Urinary Bladder Cancer Model" is published online ahead of print in the journal Bladder Cancer.